- cilindri de smirghel, pentru slefuit, 9x13 mm. Quote: there is alot of power to be had from the head. 95% of the gains from headwork comes from reworking the valve seat and bowl area. port matchin makes little to no difference on hondas. the ports are so big, they could do with a decrease in size = increase in velocity. although itr's come with 'mild' headwork from factory, it wouldnt be anything to be proud about. if you were planning on going down the headwork route, it would be a better option to get a stock pr3 head, so you have more 'meat' to work with. Quote: I love the vagueness when it comes to cylinder head work and forum chat. Over complicating things just leads to confusion and disappointment. There is no need to worry about which casting does what, which cam does this or that for the lift curve graph, how big your TB is, certainly not at the level that 99% of the honda modifying public are concerned about. There are a few facts, honda ports rely on high volume and large CSA. The port designs arent as great as the hype would have you believe, infact, they are merely average for the year. And the same reason they make great peak power from small capacities in stock trim is simply because they use significantly larger duration periods and higher rpm than any other manufacturer in the comparable market position, there is nothing magical at all in a honda engine. It is also the exact same reason that hondas make apalling torque. I'll stick my neck out and say that 99% of applications, honda ports can do with being smaller and still make significantly more torque and power. The ports are hardly 'over engineered', they are under developed. The internet is such a vast resource of information that any willing person can spend a year or so simply reading up on everything required to become an 'authority' on headwork and every minute detail that can be considered within the scope. They are usually the most arrogant. Once you deal with cylinder heads for a while you soon realise that CFM flow figures are practically useless for the majority of what you are trying to achieve. Is headwork beneficial on a stock engine? Yes, but not in the way your all thinking about. Cost? £500 wouldnt do much to help. If you consider the amount of time that actually goes into cylinder head work then you will realise that a good performing road head that costs £800 is still priced well. Why? Because your paying for a skilled person (hopefully) to apply their prized knowledge and spend countless hours hunched over a bench getting covered in haddock, damaging their joints and back all for the performance of your car. Most people are willing to let some monkey with an accounting software package charge them £150 an hour, but £50/hr for someone who is actually doing some tough, health damaging with a skill but a few people actually own.........well thats just overpriced isnt it. I invite any member of the public to work with me on a cylinder head side by side copying everything i do. After the week is done you'll never want to touch a cylinder head again and you'll feel that the work you do for the same wage is significantly easier on your body and mind. Quote: Ben, I’m trying to see your points in the context you have stated and to be honest I don’t agree on most, there far to generalised. On your final paragraph I would say it’s very easy to underestimate home much work and nasty ugly work it is and there we agree. As far as is it worth it, of course it depends on what your flow demand is and context of use and budget. I don’t have a one size fits all view no one with any experience has. Quote: Sorry, at 5am and in a rant i'm not going to make much sense. Quite simply i find it laughable what people percieve headwork is good and isnt good for, and how others go about explaning what needs to be encompased without actually highlighting any key specific areas for the honda ports. Sure, we can all generalise that a port and valve seat combination needs to be optimised for the induction and exhaustion manifolds and their resonant characteristics. That we need to take into account in/ex flow ratios, in/ex sq/mm per cc, cam duration and lift curve events relative to flow curve characteristics, cylinder relative pressure events at valve lift points so on and so forth. We can rant at what should be considered to generate a cylinder head that is suited to the application. But put quite simply, most of the internet head specialists do not account for any of this quite as far as they would like to be percieved they do. Why? Because it is simple to understand the required topics at hand, but complex to understand the content. Its a like a book with the contents page clearly written, but missing chapters. The second point is that at this level, it is pointless. The average punter isnt paying for it, so in brute reality, why should we be doing it? For full race head that is of a spec i already know will work with a certain application, excluding valve train, i'm already charging in excess of £1500. If anybody is wanting development for their specific application, double the price and quadruple the timescale. Nobody is willing to pay. So this means that the best read heads available, at a reasonable cost, will have been based around already known and desired effects and how to achieve those effects. FOr £800 your going to get about 14 of my working hours devoted to your head, and that cant possibly include much development time. A good head specialist will know what is needed and not draw on 30 different types of required parameters. If you do, and you can actually do the mathmatics behind it (i cant, i'm no quantum mathmatician), then you either over working yourself, undercharging your customers or just plain in the wrong job for your level of intelligence. So whilst you might disagree, i have about 3 key areas i like to focus on for 99% of the heads i do. And they all seem to work out far better than considering the micro factors that are only really ever encountered in top level motorsport where budgets and specialisation in staffing allows. If anybody priority concern is about CFM flow rates and racing the flow bench, attaining '300cfm heads', then your already 7-10 years behind. I was, i learnt.....my flowbench see's about a tenth of the use it once did and my heads are better than ever. Quote: Not a stretch for any head for a serious build. Then figure out how long it takes to replace one guide at the right height, with the right stem clearance etc. Then change one valve seat and do the valve cut/cuts/radius/radii you want for the particular job. Not cheap already. Then multiply by 16. Ah, hmm reaching a big number already and we've not even thought about making any changes to the head casting at all. Add in the amount of research investment there can be in finding out what to do to make suitable improvements.... well, big number. Hence why it's worth paying what initially seems a big number to someone who has the experience with the head you're using to know what's needed. Sometimes the same changes work on different heads but by no means always. I remember several years ago a guy turned up on the S2000 forums proclaiming he could do headwork on the F20C that would give gains of at least 20bhp. He hadn't worked on one of the heads before, but with his proven track record on other heads he was sure the gains would be there. To describe the F20C's ports as too large to begin with (especially on the exhaust side) is something of an understatement. However well intentioned this newcomer was, it was always going to be unlikely that applying lessons from others heads was going to pan out. Of course, if you're a spare scrap head or two you can afford to donate for experimentation and you can pay the time for that, you may get somewhere. But even after you've been through a lot of testing off car, you have to build a full head to the spec you've learned and try that for real. By know I'd hope that people are realising that any tuning is a total balancing act where the results are limited by the knowledge and skill of whoever is designing/building the balance. With engine building the head is arguably the single most important component. So if you're going for a big engine build, don't ignore the head and spend as much time as you can choosing who does the work. Quote: well, al at least we don’t disagree that it’s very detailed analytical work one that has taken me on a very long and surprising journey with some of the best and brightest. you need the right head for any given combination if you wish to reach past bolt on numbers, Hondas heads are very good for a stock piece, if you don’t have the budget to do a full job, you can at least maximise the potential of the stock castings and work with it’s strengths and weakness, with out over caming or over comping the design. We have only ever worked on combinations balancing acceleration and reliability carefully, all elements of a build work together. Costings, there are many ways to do a job, some are cheaper and some work and are reliable, bottom end builds are another case where most think one size fits all! This is nonsense, attention to detail and some of the more advanced machining / balancing teqnuiqes all pay off in a total combo. I have put considerable work in to drag b16 that has a flat and long powerband that’s spun and will hold tighter 10k rpm. It’s not easy I just sounds easy on the internet. No smart build ever considers one part at a time. I recently caught DV at a time when he actually was one spot for longer than 10 minutes and had a chance to talk about my engine program. Well one thing led to another and the subject got around to cylinder heads. And within that context we got onto port velocities, port volumes, bowl sizes and cross sectional area’s. Not long into this discussion it occurred to me that the last person that interviewed DV caused a flood of interest and a subsequent avalanche of posts. With this in mind I asked if we could make this an official interview on the subjects just mentioned. The interview in it’s entirety would be just too long so I took the most salient questions and sent them to DV to answer. And, before it becomes a controversy in itself, DV does make several references to his soon to be introduced cylinder head book (late Feb to late April 2012). That is not free advertizing as he has given us the benefit of his time which, when you think of it, that’s what he sells for a living. So the trade off is this, we get the results of valuable insights based not on conjecture but thousands of dyno tests and in return he gets space on this forum. Here, with a little editing, are the results of about 6 hours of discussion. Just to give readers who may not already know you what sort of experience do you have in the field of cylinder head porting and when did you do your first flow test? DV:- May 1958 – I remember it was just a few days after my 15th birthday. I used my Mom’s vacuum cleaner as a power source and the principle involved was really simple. To this day I believe the technique I used to actually test the heads is superior to that of the methods advocated by flow bench manufactures. Will this be in your shortly to be published cylinder head book? DV:- Yes – in there I show how to build a pro result bench for about $150 or less. Funny when I think how easy this is I always end up re-calling a story about Bill Blydenstien. Bill, who I personally know and greatly respect, won the British Touring Car Championship - back in the 50’s I believe. In a feature about his engine shop a motoring journalist made quite a deal about Bill’s technique to flow heads with water. I always wondered why do it the hard way but I never got around to asking him that. DV:- First off let me make a point here. I have never done a cylinder head without the knowledge gained from using a flow bench. That said the first time I had a cylinder head on a competition vehicle the result was front running and winning finishes. So about how many race wins can you say were due to your cylinder head tech? DV :- Let me make it clear here that just having a great cylinder head does not a winner make. It’s just a heck of a good starting point. But at the end of the day the best head in the world won’t be worth diddley squat if the valves are opened and closed at the wrong time and a host of other things are not attended too. If you are going to make the most of your flow bench work then you need to study the induction and exhaust in it’s entirety otherwise you could end up shooting yourself in the foot. The key is to start work on the head until it’s as good as it can be practically made then look at what it takes to make the most of it from there. I spend virtually 144 pages of my book ‘How to Build HP’ and 16 hours of my seminars detailing just that. It is not one single trick part that produces a race winning engine but an engine having the most optimally specced components to go with the cylinder head. As for race wins, engines I have personally built have won hundreds of races but if you take into account those I built over the phone or as a consultant it runs into the thousands. Talking of phone calls how many do you get from readers just wanting to ask questions? DV:- Far too many – people just don’t realize I do this for a living, and I believe rightly so, I should charge for my time. But I screen calls so it’s not too bad but the emails – that’s another thing all together. A little while back when I was on the phone to Jack McInnis at Dart I casually watched my computer screen as emails came in. The average was one every 90 seconds – mostly from readers that I do not know. With over fifty years of experience what would you consider your best cylinder head achievement? DV:- Wow what an awkward question - I would have to say that what would impress most readers is different to what I feel best about. Let’s go with the latter here as it will be easier to relate too. When I was doing the BTCC (1974) and acting as an outside consultant for Chryslers competition department I was working on the Avengers cylinder head industriously. But so were F1 engine manufactures Cosworth and John Judd. I believe it would be safe to say that both had a bigger budget than I and a lot more man power - I was writing about 16 – 18 articles a month for some 12 magazines at the time. To put that into prospective that’s about a full time job for some three people. In this environment I developed the Avenger race head to the point it simply outpaced my two F1 competitors by a country mile. The numbers were about 128 HP on the Cosworth/Judd head and 139 on mine. How would you best describe the science of cylinder head porting? DV:- Let’s be careful about over simplification here. Every time I see the comment that an engine is just a simple air pump I wince. In the main such statements are made by writers who have never had to develop a new engine from stock to race winning in 3 months flat. The real simple description of an engine is that it is a thermodynamically and mechanically complex air pump that presents a major challenge at every point in its design. But to give you a direct answer to your question I would have to say that in its most simple form the science of head porting is also the science of getting air to go around corners with the minimum of energy loss. The hottest topic next to low lift flow must be the importance, or not, whichever it may be, of port velocity. Want to start the ball rolling with your thoughts on that? So how do you decide whether a port is too big or too small? DV:- Well you have to understand that as a head porter you could be approaching this situation from two different vantage points. First the head porter may be called upon to produce a design for a spec of engine where certain aspects are already decided on. Let’s say we are going to do a hot street head design where the valve lift is limited by the need for long term reliability. Here the port should not be so big that it continues to deliver an increase in flow significantly past the point of maximum valve lift. If it does than you have just designed a port for a valve train which the engine is not using. In the second situation the head porter could be called upon to port a head for the maximum power output possible. Here the head is made to flow, consistent with having good port velocity, as much as possible. When that’s done the engine builder then has to come up with the appropriate parts that compliment that cylinder heads characteristics. This is especially important in the cam department. In the second instance it is really important to keep an eye on the flow increases made versus the port volume increases. When flow only goes up marginally for a given volume of material taken out then the port is probably already too big. However making that statement is close to oversimplifying the situation. At the end of the day it is vital that the port be velocity mapped to establish where the port is hyper active and where it is lazy. Again though this is simplified we can say that the lazy areas need to be filled in and the active areas need to be enlarged. At the end of the day there is a certain port area that best suits a valve diameter and that this port area is dependent on the down draft angle of the port and just how good the porter is at getting air to go around a corner that normally, it has no desire to do. There has been a lot of mention of pressure recovery at certain points within the intake and exhaust reacts of an engine – care to comment on that? Now, bearing all the forgoing in mind we have, at various points within the induction and exhaust systems, shapes that, to a greater or lesser extent, approach a venturi shape. As such they can make our flow tests artificially appear more efficient than they actually are by virtue of the way we are measuring them. Take for instance a valve just a few thousandths off the seat. If you look at a cross section of this it looks a lot like a venturi. That is why at low lifts and using the real area that exists as developed between the valve and seat, we can end up with a flow coefficient that is over 100%. Many of my heads show in excess of 110% efficiency at 0.025 and 0.050 lift. But that is just because of the way they are being measured. Some of the exhaust ports used on ProStock heads that have been across my bench (and hopefully on F1 engines if the job is being done right) are exhibiting efficiency numbers right around the 100% mark. The reason is that the port itself is now so steeply up drafted that, with a radius area just below the seat, the port takes on the form of a bent venturi. So how do you see pressure recovery helping with output? DV:- To explain what can possibly happen here let’s consider an intake port. Basically we can look at an intake port as two separate entities. First the main body of the port where the highest bulk port velocities are to be seen and second the bowl volume where the flow area expands to that of the inner valve seat and sometimes more. What we see here is that velocity in the main body of the port is reduced at the point the area opens up within the bowl. This causes some of the kinetic energy to convert to pressure. So the pressure at the back of the valve now increases thus increasing the pressure difference between the cylinder and the port. If this all actually comes about in practice then we now have a situation where there is more pressure driving the charge past the intake valve on into the cylinder. But that is a grossly simplified view of the situation. In reality we have all sorts of pressure changes caused by pressure waves and the demands on the intake port made by the exhaust scavenging action and the pistons induction action. So let’s take a broader view of this and do nothing more than suppose this pressure recovery might just be possible in some shape or form. If we do that then we actually invoke the comment I made earlier about a porters prime function in life is to get air to corner as efficiently as possible. Just like a race car if we want to take a corner it becomes more practical if we slow down to do so. The only difference between corning air and a race car is we need the air to do so with zero energy loss. Just like the race car we should plan on slowing the air down to take the turn from the port past the valve. If we can shape the bowl to do that as effectively as possible then we have a chance of utilizing any pressure recovery that might take place plus the fact that the head with a more efficient port to bowl area flows better, to see an advantage in output. What about port to valve size or area ratio’s – is there some magic number? DV:- There certainly is but it’s one heck of a moving target. As I have just said there are numerous factors that influence what the port area to valve area for optimum output should be. First the steeper the port angle is the larger the port area to valve area when maximum output is the only criteria. If valve lift is a limiting factor than the port area has to suit that so there is another option. If low speed torque is an important factor than that also has an influence. And the list goes on – my book will cover that subject in more detail. Probably the best thing to do here is for us to look at the results from some tests I did with the Ford 2 litre Pinto two valve per cylinder engine as used through the 1970’s and into the 1980’s. Here I did some experiments with port area to bowl volume. I used this engine to test a variety of tuning concepts not only to find out about Pinto engines but also small block Chevy engines. The reasoning here is that the Pinto engine has a similar bore /stroke ratio as well as rod/stroke and valve area to displacement ratios. That and a number of other geometric similarities allowed me to do tests that covered all similar engines. Pinto engines only required half the work to do the experiments I wanted to do and cost less than half to build. Anyway - these port/bowl area tests were pretty extensive but we only need look at two principle points within this batch of dyno tests. On the graph that follows here you will see the results of tests with two cylinder heads on an engine were we had three cams, each with a slightly different lobe centerline angle, all the be used with an adjustable cam drive. The two heads concerned flowed very close to the same throughout the lift range with the only real difference being the port velocity in the main body of the port about 10% higher with the smaller port. If the smaller port head did show any advantage in output it could possibley be due to some pressure recovery in the bowl helping push the charge into the cylinder more effectively. Let’s consider these numbers first then look at what the root cause might be. What we have here on the graph above are the tests of a 2050 cc Pinto engine of some 10.9/1 CR at equipped with a set of 45 DHLA Dellorto carbs and a 4-2-1 exhaust system built for the job. Cam was some 280 degrees at lash with about 0.500 lift. The blue lines are for the bigger port smaller bowl head and the red for the smaller port bigger bowl head. Note the smaller port head pulls noticeably stronger at 1500 rpm. Sure there was a dip at 2500 but I suspect that was an elusive carb calibration issue we could not find the fix for. The smaller port head also produced more peak torque and it hung on better at the top end. Obviously if the port was reduced yet again things would change and sooner or later the tradeoff between velocity and flow would defeat the smaller port. What this does show is that it is as bad to have a port too big as it is too small. So at the end of the day port velocity and possibly pressure recovery at the bowl can pay dividends. 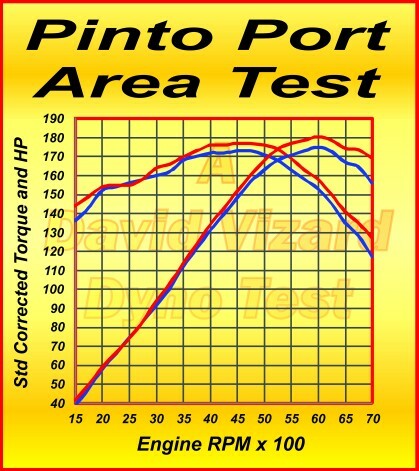 Also as a matter of reference I did some port volume/area tests for Dart and the results are on their site at http://www.dartheads.com/tech-articles/port-volume... From these tests it is easy to see the part that port velocity plays in not only the production of torque and hp but also the shape of the power curve. How well do you think the top head producing shops like Dart, AFR, Brodix etc are doing as far as bringing cylinder head technology, especially in the porting department, to the market. DV:- For the most part they are doing well other than being a little conservative. I have to say that most cylinder head companies think there is not a lot left in head designs within the current 2 valve pushrod envelope. That is not the case. I have head technology that I have been waiting to sell to a client/s for years and with no takers because I have not been able to put up a convincing sales pitch. I really don’t want to take this tech to the grave so now I include it in my seminars but it is confidential that is why I now have all my attendees sign a non-disclosure agreement. That agreement appears to be holding good over a lot of attendees. Notice there has been no leak on the magic cam selection number of ‘128’. Yes the mysterious 128 - go to the opening video at http://www.davidvizardseminars.com if you want to see what that is all about. But to continue - in the grand scheme of things how far along the road would you say we are in terms of the kind of cylinder head technology we currently have? DV:- To do that we would need to quantify were we are now so we have a yardstick. Sure we can do that mathematically but most people don’t immediately relate to a number. Something graphic is needed so that the answer to the question is absorbed almost immediately. I have an illustration in my book that demonstrates the magnitude of the job of flowing air through an engines induction system in sufficient quantities to satisfy the demand of a high output engine. Most people, when seeing this illustration are amazed we are able to make 40 horses per liter from a two valve engine let alone 140! What this illustration does is spur a dedicated porter to greater efforts. That is not however to say that amazing advances in cylinder head capability have not been made. But they can always be made better. The push right now is in the area of thermal and wet flow management. Even so there are many gains in airflow still to be had in area’s that so far remain explored by precious few people. Have you ever looked at port pressures along the length of the port with pressure transducers as per the TFX ones you used at your UNWO seminar back in March of 2011? DV:- No - but I did jury rig some experiments which do at least point things in the right direction. Here’s how I did that. Using a small block Chevy as a test mule I tapped into the intake port runners at two points. One just to the side of the valve guide in the bowl and one just before the end of a parallel section in the port by where the pushrod pinch point normally is. I had, by filling the port, eliminated the pinch here and converted it to a parallel section right up into the intake runner. The tubes connecting each point in the port were then fed into a non return valve and then into a junction box. From here each set of eight tubes went to a sensitive manometer which had the other end attached to the manifold plenum via a solenoid that shut off when the throttle was not at the wide open position. So what we had here was 8 tapping’s at the valve guide and 8 tapping’s at the port. The plan was to compare the two when the engine was at WOT. Now I have to say that all this was a bit fiddly but in the absence of electronic sensor (this was 1985 ish) this was the best that I could come up with. It cost little more than time so I went ahead on the chance it would show something along the lines we are talking about in terms of pressure recovery. All this is going on in a set of ports with wild pressure fluctuation issues so all data had to be considered with this taken into account. As far as possible I tried to position all the tapping’s into the ports so they did not see the effect of a pressure head as per an airspeed indicator. The problem is that is not easy to do. I don’t want readers to take the results here as anything absolute but The pressures in the bowl area were consistently higher than in the port runner. Usually only by a few inches of water but none the less higher. What was also seen was the pressures that were brought about by pressure waves and overall inertial ramming. I did see as much as 3 psi positive in the port bowl as compared to the plenum. One thing is for sure that my tests over the years show it is better to be slightly on the small side in terms of port area than it is to be slightly too large. The reason here is that port energy drops off faster when the port is too big than port flow drops when it is too small. The fact that I use relatively small ports in my BB Chevy engines and yet still produce really big HP and torque numbers is a testament to the fact that port velocity is a vital ingredient here. Consider this – Port energy is ½ MV2. This means that if a port is 10% too big the port energy is 22% less! Where do you see the greatest gains in cylinder head coming from in the next decade? DV:- At the big sale commercial level I still see improvements of airflow without extra port size. In addition to that better wet flow properties and consequently better combustion properties. Also thermal management of the intake flow is going to become far more widespread. Top teams and engine builders have already made good use of this for the last decade or so but it has yet to filter to the general rank and file. The other issue here is wet flow testing but unfortunately I see so many mistakes made in this area that a lot of what could be had is not realized. From what you have just said it’s apparent you have wet flow testing experience. When did you start? DV:- In the search for more power from my Mini engines I first got into the subject of wet port flow back about 1967 maybe 68. All this came to a head so to speak when I became involved as the project leader for the ‘Around America Economy Drive’ project using a Mini as the vehicle of choice. Here, working with several other highly competent engineers, I got to do a significant amount of work studying the effects of mixture atomization and preparation in relation to part throttle fuel economy. The result was a drive, in 1976, around the USA in a 1275 Mini GT with the family and all the luggage needed for a 3 month stay. This was no ordinary creep from point A to point B economy driving and doing so only when the sun was out and the air was dead still. This Mini was road tested by Car & Driver, driven on run flat Dunlops to determine how well they handled both on and off road conditions by Motor Trend and so on. Also I had to bash my way through 3 foot snow drifts in Wyoming by charging them in second or third gear at WOT. Failure to make it through these drifts could have meant freezing to death. I remember arriving in Laramie and noting that there was ice on the radiator in spite of the fact the engine was running. Indeed it was so cold that the heater only ever got to luke warm. All this and our mini averaged 49.88 to the gallon on our arrival back in New York. All this was detailed in one of the big UK ‘How Too’ auto magazines in 1976 – anyone remember it? Interestingly enough I did this to wave the Union Jack but when I asked for some sponsorship from British Leyland they said my goals were engineeringly unreasonable. So, sponsored largely by a Japanese TV and electronics company, I set out to prove that once again they were wrong. Still on the subject of wet flow do you have any thoughts or insights here to pass on? Any interestingly positive wet flow test experiences to pass on here that show the worth of wet flow testing? DV:- Well yes – I have good Jon Kasse story here. I’m on the phone with Jon and he happens to mention something about the wet flow test he has done on his super big inch (800 – 900 CID or 13.4 to 15 litre) mountain motors. He asks if, while I am there, I would take a look at what he is testing. So I arrive and get a first hand view of what he is doing. Jon makes the point that he is making zero progress on his wet flow bench with these big Ford heads. I take a look at what he is doing and what do I see? Just the best wet flow characteristics on a head as I have ever seen. To be fair it was about as perfect as you could get hence the lack of progress. But that’s Jon – a perfectionist to the last. Interestingly Jon was also working on a super big inch Chrysler engine and though the dry flow figures were the same the wet flow was nowhere near as good. The Chrysler engine was about 200 hp down on the Ford. So if you ever wondered whether or not wet flow was worth anything wonder no more. OK going to wrap up this interview here. I am sure Mr. V has given us enough tech to argue over for the next 3 months.